Help Shibshankar Carve a Creative Career And Come Out of Poverty. Few of our children have passed class 10th and 12th this year after defeating a lot of practical challenges like facing abusive parents, abject poverty, impossible circumstances to live or study etc to name a few. Among them we have a few naturally talented children. To ensure their hardships don't go waste, we are trying to push them into interesting fields where they'll shine, carve out a creative career for themselves and pull their families out of the vicious poverty cycle, eventually. Shibshankar is one such extremely talented and very well behaved boy living in the slums of northern fringes in Kolkata. Father's income is very unstable and works as a bus driver. 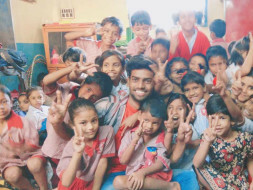 Calcutta Rescue is helping with his studies since he was a 4 years old child. Shib has recently passed XII-th with 67% marks. He loves to sketch whenever he can. When free, he would come to our school and teach the younger children the nuances of sketching. He is extremely creative and is very interested to carve a career out of it. CR is trying to help him do that.